Anyone want some self help French style? 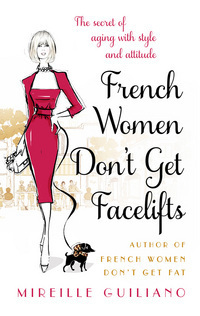 French Women Don’t Get Facelifts” is a self-help book that reveals the secrets of the sophisticated French beauty routine that does without botox and facelifts. “France has always been a country of chic, fashion, seduction, savoir-faire and charm,” said the author, Mireille Guiliano, whose previous book “French Women Don’t Get Fat” was a bestseller! Guiliano is known as “the high priestess of French lady wisdom” and her latest book is subtitled “The secret of aging with style and attitude.” Her “anti-aging food prescription” includes beet mille-feuille, tartare of cucumber and tomatoes, and chocolate souffles with piment d’Esplette. Enjoy but where’s the wine? This entry was posted in Book Reviews, Books and tagged beauty, Book Reviews, French, Self Help. Bookmark the permalink.